Today I thought it a great idea to show you some quick and inexpensive way to make multiple cards for those of you that have a looooooong Chrissy card list. These cuties are made from cutting 12 x 12 cardstock into four 6 x 6 pieces – easy for those with a Dreamkutz (thanks Kyla for that hint!) Each piece is folded in half to make a 3 x 6 card. These cards are great to use up those ‘bits and pieces’ of scrap paper that you’ve been hoarding and those fiddly pieces of ribbon. HINT: If you’ve hoarded little pieces of ribbon that are too short to tie a bow, just tie a single knot (loosely) in the centre. Check out the photograph above carefully and you’ll see the pieces that I’ve used that were too short to tie a bow or double knot. 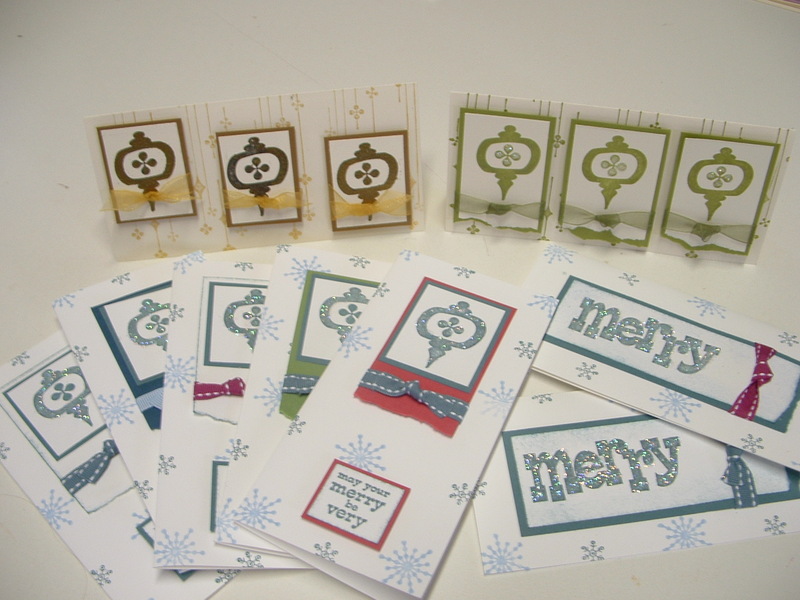 Tomorrow, we’ll do more chrissy cards a la process line using a non -Christmas card stamp set. See you then!